Welcome to the website for the Dunbeath Broch Project! From 20th – 29th August 2018, we undertook a programme of consolidation work and small-scale excavations at Dunbeath Broch, Caithness. The fieldwork might be over, but you will find details of upcoming events on the Calendar page. The broch at Dunbeath is one of the more accessible and best preserved examples of this iconic Iron Age monument type in Caithness. You can read more about the broch and its history on Canmore. Time has taken its toll and the broch’s structure is deteriorating in some areas; work to slow or prevent this deterioration and secure the broch’s future starts on 20th August 2018. The project has a programme packed with an exciting range of activities that give people the opportunity to get some hands on archaeological experience and to explore their local heritage with some of the country’s leading archaeologists and historical experts. There is something for everyone and events are free and open to all. The programme kicks off on 20th August with the project launch and introductory talk in the Dunbeath Heritage Centre at 7.30 p.m. Work onsite runs from 20th to 29th August and volunteers of all ages can get ‘hands on’ under the expert guidance of professional archaeologists. No previous experience is required and all training and tools will be provided. On Saturday 25th August from 10am-4pm, a Living History Day at Dunbeath Heritage Centre will feature James Dilley of Ancientcraft. James is an archaeologist, craftsman and re-enactor who specialises in all prehistoric technologies. His outreach objective is to encourage people of all ages to learn about long-lost crafts by bringing back to life our ancestors skills and knowledge from the primitive past. He has worked with museums, heritage centres, media (Time Team; Coast; National Geographic; The Great British Countryside, New Scientist Live), publishers, photographers, schools and geologists in research and experimental archaeology. James from Ancientcraft and Charlotte Douglas, Community Archaeologist from AOC Archaeology Group will also work with Dunbeath and Lybster Primary Schools to introduce pupils to the work of archaeologists and help them gain a clearer picture of the broch and its Iron Age builders and inhabitants. From 7th to 9th September the programme continues with a drystone workshop at the Dunbeath Heritage Centre under the guidance of local expert George Gunn, giving participants the opportunity to learn the basics of traditional drystone working and to help construct a stonework broch seat in the garden. Following completion of work onsite, an interpretation workshop on archive research and the key principles of interpretation will be held in October in preparation for the design of an interpretive panel to be installed at the broch site. Further details of venues, dates and times for the workshops will be published on the events page once the fieldwork has been completed. 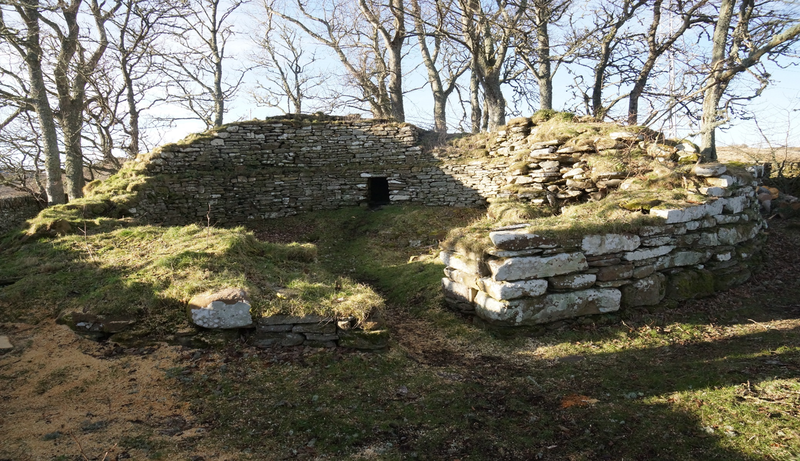 The Dunbeath Broch project is led by Berriedale and Dunbeath Community Council and is supported by funding from the National Lottery through the Heritage Lottery Fund, by SSE Beatrice Fund, Highland LEADER programme and Historic Environment Scotland. Participation in the excavation and consolidation work is free and open to all – no experience is required, and tools and training will be provided. Please get in touch with Charlotte at AOC here to sign up or to send us any other queries you may have.